Seems unthinkable now that 12 months earlier we had one of our biggest challenges to date to make in preparation for the opening of our Bakehouse, when we started looking at what would be our most expensive purchase, a deck oven, we froze! We were like rabbits in headlights. We then started looking at Brook and it’s true their website is like a maze of machinery, we made our decision about what we needed, a x12 tray deck oven, a 60kg spiral mixer and a Laminator, they were pretty much our high ticket items. So we called the Brook office and and dealt with Ann, she seemed nice and was excited to hear about our plans. We then spent what was weeks going back and fourth refining the order and went to the NEC for a trade show, to see the whites of "Brooks eyes", and see if we could trust the people which for us was a massive part. Like kids in a sweet shop we glided round the kit, beautiful shiny ovens that were also super stylish (which is always important!). And, with further help, advice and enthusiam we met Ann and the rest of the Brook Team. Our relationship started there and continues to this day as we share regular updates about our progress, the products we have chosen and their performance which has enabled us to get great consistency in our product range which in turn has rocketed our customer base. This relationship is built on trust of products and people and the desire to succeed for all of us. Our Polin oven remains the star of our bakehouse, with its devilish good looks and Ferrari engine which ironically we are finding very economical- cold to screaming hot in just over 20 minutes! Waldrons Patisserie has been a customer of Brook Food for over 20 years, the majority of our equipment was purchased and installed by them, most is still in use including our two 3 rack Double D ovens, countless Hobart mixers, pie presses, conveyor systems and much more. This machinery was not brand new but is still in use every day, when servicing is needed the Brook engineers are on site quickly. I would highly recommend Brook food for machinery purchase and servicing. I first encountered Brook and the Rofco ovens when I saw an advertisement on Twitter for a competition to win an oven from them. It was like a light bulb moment for me. I’d been looking at commercial ovens for some time, but they just weren’t practical in a domestic setting. The Rofco seemed to fill this gap perfectly. My latest food related wheeze started in 2013 when I ran the first “Bread Nose Day.” This was intended as a pun on Red Nose Day, and was a fundraiser for Comic Relief. I was early in my baking journey, but enthusiasm triumphed, and with the assistance of 2 friends we managed to raise about £600. Roll on 2 years, and with Red Nose Day coming around again I decided to take on Bread Nose Day again – but on a bigger scale with the objective of raising more money. With Bread Nose Day approaching fast I contacted Brook Food with a cheeky request – would they lend me one that I could use for the event. Although I’ve got a double oven cooker at home, this just wasn’t going to deliver the throughput we needed to raise the money we wanted to raise. Much to my surprise and delight, the response I got back was not only yes, but what else could they do to help. We looked at options and agreed that the Rofco would fit the bill well, and that a mixer would also make the whole process easier. I have to say that Brook were amazingly helpful during this period. Not only were they prepared to take a chance on a project that they knew little about, but their communication was great. I felt I was dealing with real people rather than yet just a faceless, nameless corporate entity. One week before the event a pallet arrived on the drive containing not only a Rofco B40, but a Hobart A200 mixer as well. This really was going to increase our capacity. My first job was to get a test bake on the go so that I could get my timings and quantities lined up for the following Friday’s mammoth bake. Bread Nose Day 2015 went exceptionally well. Overnight I baked nearly 70 sourdough loaves of various sizes and flavours, 60 hot cross buns, 30 sausage rolls, and fried 80 doughnuts. My fellow bakers also contributed another 40 loaves and over 100 bread rolls. We got to a total of £1000 sent directly to Comic Relief. So, what were my first impressions? • It’s a great size – it’s just a little taller than the under counter freezer that had to be displaced to the utility room. • It has 3 decent sized baking surfaces – the capacity to be able to bake 12 1kg loaves in one batch. I find mine take about 45 minutes to bake. • Heat Retention – the refractory stone that’s used to make up the baking surfaces retains heat really well – this means that there is good thermal efficiency in the oven leading to lower operating costs. A good example of this is that I now cook breakfast in the oven after having turned it off. • It can run on a domestic 13amp supply – Always important to get your own advice on this, but I’ve spoken to other users, and as long as you’ve got modern wiring you should be OK.
• It bakes great bread – I’ve had better results from this oven than I’ve ever had from my regular domestic oven. The crusts are better, and the loaves seem to achieve a decent bake in a short time; 45 minutes rather than an hour. How did it go from a loan to a permanent acquisition? Because I’m a firm believer in having the right tool for the job, and for me this was it. It was just too good to let go of. It reduced the time it took me to bake in the morning, produced a superior loaf, and made my baking life easier. It had to be kept. Since introducing our first Polin Multidrop Depositor into production we saw a 200% increase in output, we found the one machine can do the work of 5 bakers. We have found the results are always consistent and there was no hesistation deciding to invest in a second machine, which has allowed us to further increase production and commit to new national contracts. The Polin mixers do a consistent job for our roll production. We have been especially delighted with the Customer Service that Brook Food have afforded us. We're in production 24 hours a day therefore reliable kit is essential. We are fortunate we have Brook to look after us. Equipment supply and maintenance is reliable and effective. The machinery we have from them extends through the factory across all areas of production, we've built a relationship with Brook underlined by our shared interest in improvement. We purchased our Polin Multidrop nearly two years ago and have it running for 8 hours, 6 days a week. It’s reliable and doesn’t give us any trouble. I’ve found that work that used to take 4 bakers 10 hours a day is completed automatically in 2 hours using the precise wire cut facility on the machine. We find our Polin mixer very reliable and consistent for producing full range of quality doughs for various roll and bread production lines, plus the back up from Brook Food is excellent. I installed an in-store bakery into my first supermarket years ago, the equipment was refurbished and of the highest quality and immaculate. Since then I’ve gone back to Brook as my preferred supplier for everything else I’ve needed because of the care and service they provide. Reach depositors offer a quality build and a reliable solution to many applications across the food processing spectrum. They are consistent and accurate which is crucial. I have worked with Brook trialling machinery for a client and had very good help with trailing and understanding the capabilities of the kit. Recently I bought a Polin Pastry Brake and Specialist Wood Topped Table for my Test Kitchen, the order was fulfilled within 1 week and the delivery was excellent. Quotes are quick to get, really can't complain. I plan to work with them as I expand my business. We’ve been a customer of Brook food for many years. They have excellent service and sales knowledge and very helpful kind staff. We would always highly recommend. Such a great company to work with, provided good honest information, supplied a wide range of new and used equipment and everything from big machines to small accessories. We will be using Brook Food Processing again in the future - great customer service. All members of the team from sales, logistics, drivers and engineers were really helpful. I’ve been using and recommending the brilliant Rofco B40 ovens for about 3 years now. Incredibly versatile ovens which produce truly professional results impossible to tell apart from larger deck ovens. Economical to run and perfect for startup microbakeries as well as small cafes and restaurants wanting to bake their own. I bake everything from bread to pastries cakes and more. Highly recommended! Thank you and the team for all the support over the years. From developing The Flour Pot bakery concept until now, Brook have always been there for us when needed. I have often called for no more than just advice and you've been happy to help. With regards to selecting and purchasing the right plant for us its always been a pleasure. I have recommended you to many fellow bakers and will continue to do so. I would say in my professional opinion that Brook foods are the best bakery machine supplier there is, right from the very start of the process, the staff have alot of knowledge and understanding in what they are selling, so they can advise you on your requirements and not oversell, delivery and installation always goes to plan, they have never let me down, and the back up service is second to none, Price is also very fair, which is usually the deal clincher ! With the motto ‘A place to gather’ the Our Bakeries outlets aim to provide their customers with an authentic, comfortable experience. Their artisan bakery-restaurants focus as much on the food produced as the relationships built under their roofs. Now with 5 outlets, the bakeries all feature the same equipment. This wasn’t just the owner looking to get a good deal on purchasing the same kit, instead it’s been about much more than this. Clive Cobb says that the oven in particular is the single most important thing within each site and finding the right one was crucial. 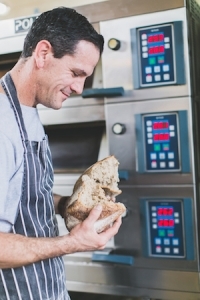 “We needed an oven that baked great bread and we knew from the offset we could rely on a Polin for this. But we also knew that the oven would be the centre of all attention and a total focus within our bakeries, it had to be pretty. Not only do our Polin ovens do their jobs well but they also fit seamlessly within our brand - nothing is hidden, the glass doors allow the customer to see everything in there and the dramatically lit decks create theatre and a focal point”. The beauty of the Polin ovens is that they are modular and are available in many configurations and sizes. 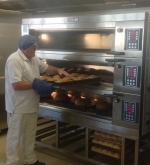 When opening new sites the Our Bakeries chain have been able to specify an oven to suit expected production needs with the ability to grow the oven over time as needs increase. Clive loves the fact the oven can be tailored to his need “At one site we started out with two decks, within a few weeks we knew this wasn’t enough, so we added two more”. Reliable and responsive elements allow the oven to heat up to temperature very quickly with the stone soles of the decks offer an authentic unrivalled artisan bake. Clive comments that in their shops the Our Bakeries teams use the deck oven for everything else too. “Of course we bake our Cakes and Pastries in the oven but also the bacon in the morning, the meat and vegetables at lunchtime, it’s even a plate warmer for us”. He comments that the ovens are the true “Heart and Soul” of the bakeries. We had a 40 year old bread plant, the motor went down and I couldn’t source another, not even from the manufacturer. I called Brook and in their massive stock of used equipment and parts they had the exact bits we needed, they were delivered to me in Ireland within 4 days. Brook got me out of a very sticky, and potentially expensive, situation and I am delighted with their service and technical knowledge. When we’ve bought equipment, we’ve delighted with it, and it’s great to be able to visit them and to see what’s available. In previous times, dirty trays were acceptable and it was the blacker the tray – the better the end product, but these day’s customers and auditors do not want to see carbon. We use the machine for nearly every tray after every bake and this normally equates to it cleaning around 6-7,000 trays per day, it fits seamlessly into our production after packing and its robust build is of real quality, it’s definitely up to the job. As past President of the Western Region Craft Bakers, and Sales Manager at BAKO Western, I felt there was a need to offer Craft Bakers in the South West an opportunity to upgrade or purchase quality used and new equipment from a knowledgeable company with back up engineers and service team. Brook Food offer the opportunity to make use of their most modern and excellent Bakery facility to train and educate the trainees and apprentices of the Craft Sector. The site at Williton in Somerset is an exciting new development in our ever evolving hands on craft trade. We manufacture Chinese pancakes and other thin pastries and the Polin Spiral Mixers we use effectively cope with the relatively stiff doughs and perform with admiration, to us the Polin machines are a crucial part of achieving a consistent product range. We visited Brook before purchasing all our kit and were very impressed with the set up. Being able to run trials with various equipment first saved us time, frustration and money. It was really beneficial for us to be able to test bake a variety of products in the Polin Oven at the Brook Food Test Bakery, this has given us the confidence that this oven will work very well at our testing facilities at Wright’s Bakery Ingredients. I’ve purchased two Provers off Brooks in the past and most recently a four deck Polin oven off them . If you are wanting first class equipment and service look no further. Excellent service Thanks ! I have found Brook great to deal with ,we have just purchased our third delivery from Brook and once again found them very helpful . It was crucial to choose the right oven for Coombeshead, it was going to be the literal hearth around which the whole space would revolve. I knew the kind of bread I wanted to bake – sourdough loaves, relatively high hydration, using British, stone-ground flour. And I wanted to be able bake hot and dark, loading the bread in a hot oven with plenty of steam for the minimal amount of time to get the full, dark caramelisation that I always strive for. After extensive research, and frequent conversations with the team at Brook Food, the Polin became the clear choice, we’ve been delighted with the results. The oven generates plenty of steam, producing a glistening, crackling crust. The heat is high, but also somehow quite gentle, avoiding the hot spots that are all too common in bread ovens. It also looks great – standing proudly in the space, a real centre-point to the whole room. I’ve learned that a good oven is one you don’t have to worry about – that you don’t have to compensate for, or work around; you set it, and it works. The Polin is at temperature when I get to the bakery in the morning, and doesn’t stop until the last loaves come out. No breads get sacrificed because of awkward loading spots, or flooding from too much steam, or uneven colouring on the front to the back - each loaf comes out just like every other. It's incredibly consistent. When we were choosing the oven, the decision gave me plenty of sleepless nights. It’s not a choice you can afford to mess up. I have never regretted the decision to go with Polin, and I don’t think I will. I’m baking the bread I want to bake, with no need to compromise on ingredients or recipes. The project, and space, is built with the long term goal in mind, and I see myself baking in the oven for many years to come. 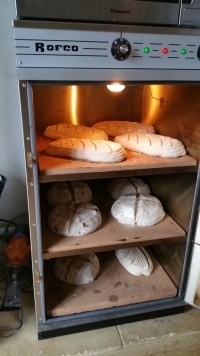 Our newly installed Rofco has enabled us to bake bigger batches and our aim is to have bigger groups enjoying classes here and for them to enjoy and learn the benefits of a wood oven and a Rofco, the dream pair in our eyes. We hope to expand further in 2019 nd look to use this as a springboard to do so.